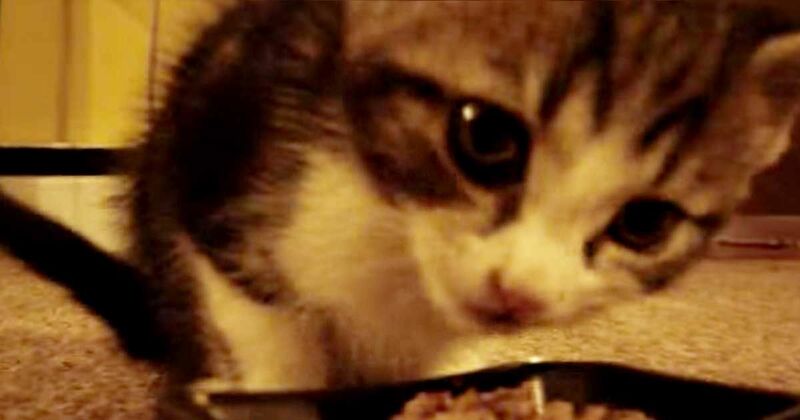 A cat's meow isn't the only adorable sound to come out of our feline friends. A viral YouTube video showcases an incredibly small and incredibly cute kitten "nomming" on his food as his owner watches closely. In the video, you see little Allan leaning over his dish of wet food and making a squealing meowing noise that sounds like "nom nom nom." The video is three minutes of this cute feasting feline who even turns to his friend's dish to continue the festivities. An article on The Dodo sheds light on this kitten's weird noises. They might be a defense mechanism. The site explains that when a cat perceives change in its environment or detects a potential predator, it will become more vocally assertive. So, maybe Allan loved his food so much that he didn't want anyone thinking they could have a bite too. Whatever the reason, it makes for a pretty cute display! Check out the adorable video for yourself below, then share it with your friends on Facebook!